Tonight, AJ Styles has a chance to take Jinder Mahal’s WWE Title, but Mahal is confident that he will continue being champ. Shane McMahon heads to the ring. Shane says that this year, Survivor Series is personal. He holds Angle and Stephanie personally responsible for Kane’s attack on Daniel Bryan. He then introduces a team he is very proud of for what they did on RAW last night: New Day. Kofi says they didn’t intend to help Rollins and Ambrose lose their titles, but that’s what happens when RAW is put under siege. New Day is willing to accept any repercussions their actions have created. Shane approves of everything New Day has done, and he begins to dance with New Day when Kevin Owens and Sami Zayn walk out to the stage. Zayn accuses Shane of setting himself and Owens up to fail. Zayn is still upset about losing to a low blow from Randy Orton. Owens is upset that he and Zayn aren’t representing SmackDown even though they are the top two superstars on the show. New Day lays into Sami Zayn, and Shane says he and Owens seem like they feel entitled. Tonight, they’re entitled to some matches. Zayn will face Kofi Kingston. Right now. Good match! I’d like to see this match happen again. Both guys were hitting their moves with aggression, and Kofi in particular really seemed to be on his game tonight. He hit a number of good moves, including one I don’t remember seeing. With Zayn on the floor, Kofi bounced himself stomach-first off the top rope and flipped his legs forward all the way down to the floor. It was surprising and fun to watch. Zayn, too, seems energized by his recent alignment with Owens. I hope it leads to something good for him. Renee Young asks Jinder Mahal (with the Singh brothers) how he’s preparing for AJ Styles since he’s been focused on Lesnar recently. Styles says Styles is just an appetizer, but he’ll make a meal out of him tonight before he feasts on The Beast. The Bludgeon Brothers are here to make the horrible world worse. Already in the ring, Aiden English sings about Rusev Day. This was okay. It was short and went as most people probably expected. It was an average, short Orton match with no real drama, despite the stipulation and all the people watching. James Ellsworth asks Tamina to go get Carmella from the women’s locker room. Instead, Becky Lynch comes out. Ellsworth acts condescending to Becky and women in general. Lynch then insults Ellsworth’s manhood and walks away. Clips of the building tension between SmackDown and RAW. It was kind of clunky at times, but it was pretty fun for the spectacle it was supposed to be. It was silly and there were times when it felt too choreographed, but I liked it alright. Carmella gets in the ring after the match, but instead of attacking Becky, she kicks Ellsworth in the face. Carmella takes her briefcase and leaves. Shane McMahon informs Natalya that, because of her actions at Hell in a Cell, she will defend her title against Charlotte next week on SmackDown Live. Natalya doesn’t like that, but Charlotte does. This was interesting. The Usos came out strong, attacking Gable and Benjamin before the match. The match ended quickly after it began though, due to the actions of Chad Gable. This is interesting because it puts doubt on The Usos ability to compete at Survivor Series. It also pretty much guarantees this feud will continue. And at the same time, it makes it seem like The Usos pre-match attack worked too well. It put Gable off his game, but it put him so far off that he might have injured Jey Uso. Renee Young welcomes AJ Styles. Styles continues Mahal’s metaphor, saying that Mahal needs to work on his portion control. He’s also going to prove that SmackDown Live is the House that AJ Styles built. Great match. This match had a lot of things going for it. For one, Styles can make anyone look great, and he did just that with Mahal. Not that Mahal isn’t good, but Styles elevated Mahal’s game quite a bit in this match. Mahal convincingly dominated Styles throughout a good part of the first portion of the match. 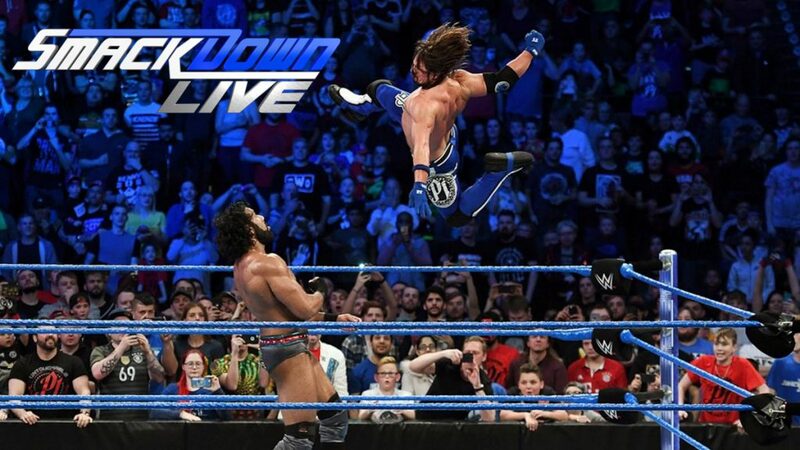 Styles slowly mounted a comeback, and when he was hindered by the inevitable actions of the Singh Brothers, Styles seemed to gain even more momentum. The action was great in this, but added to that was the fact that there was a title change last night on RAW, so this definitely had a big match feeling going into it. I think it delivered, and it sets up a lot of good things to possibly come in the near and distant future. This was a good show. It feels like they’re really picking up momentum heading towards Survivor Series. I think the fact that they were in the UK these past two night had a lot to do with that. The UK shows always seem to feel special, and this was no exception. Some big and interesting matches happened here tonight, and Survivor Series continues to shape up to be a very interesting show. Now, if we could just do something about the IC vs US title match, I’ll be all in for the show. As it should be, the WWE Title bout was the match of the night. It was by far the most exciting and had the best action. None of the other matches really tried to steal the show from the main event, yet they were all entertaining for their own reasons. This was a well-balanced show, and the main event was a big payoff for the night and for the last few months.